It is summer. It is hot. Since we don't have central air conditioning we have to find other ways to cool off. We have been spending a lot of time at our local lake so far which has been fun and exhausting. We have also been able to visit some family pools as well which is a nice change of pace from the crowds. 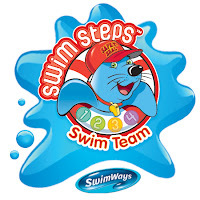 Our three older boys are in swim lessons at the lake and we have been using the SwimWays Swim Steps gear to help them out in the pool. For my six year old who has taken multiple swim lessons in the past, I chose Step 4 for him. He does really well in the lake or shallow pool where he can stand, but in deeper pools he still needs help. On Father's Day we visited grandpa and broke out the FishBites Soft Swimmies for the first time. You may be familiar with traditional swimmies that are vinyl and can be such a pain to get on and off your child's arm. You have to make sure you wet their arm just right so that they don't get plastic burn from you ripping the darn things off of them. What is awesome about these swimmies from SwimWays is that they are covered in a layer of fabric. Let me tell you, these were so easy to slide on and absolutely no skin graphs were needed afterwords. And my son loves the sharks on them. Children who can swim on their own often need a little extra support as they refine their swimming abilities. 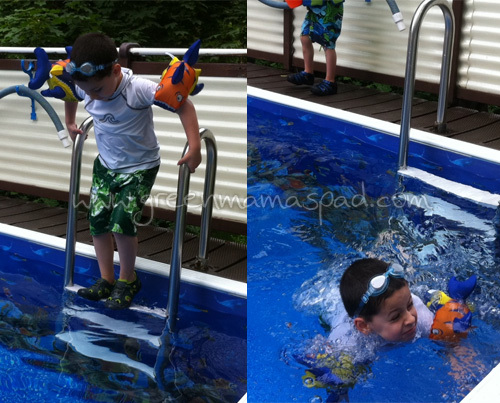 Swim Step 4 products like our fun Swimmies with fish and Disney graphics, and our silly Fishkicks kickboard with its googly eye, are designed to combine comfortable support and freedom of movement, giving kids the confidence to master swimming skills. As I sit here writing this post with the news on in the background, I have watched two reports of water related accidents that happened in the last 24 hours alone in my state. A teenage boy swimming in a lake went under and was not seen again and a four year old was playing unsupervised in their backyard and was found at the bottom of the pool. They are still searching for the teenager's body and the little boy is in ICU - hopefully on his way to recovering. My point is as fun as the water is, it is also dangerous! It is so important to take the proper precautions when you are in and around water. If you have a pool in your yard, make sure your kids can't get in there. Children should be supervised in and near water at all times - having a floating device like a vest or swimmies does not mean you can leave them alone. Please, please be safe as you stay cool this summer! Join us on Thursday, July 14 at 9:00pm EST for a discussion on the Swim Steps program as well as water safety. 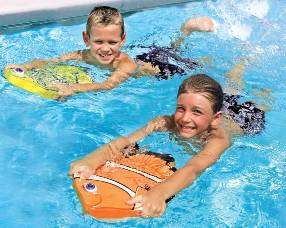 SwimWays will also be giving away over $250 in prizes during the Twitter party. To participate you need to follow @SwimWays and use the hashtag #SwimSteps when tweeting. 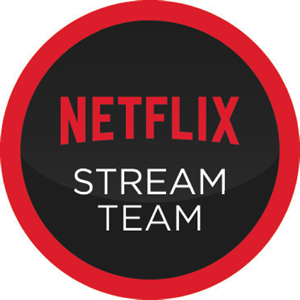 You can follow along easily here: http://bit.ly/pd8ptI. 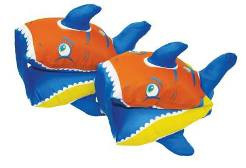 One (1) winner will receive their choice of FishKicks Kickboard or FishBites Swimmies. Leave a comment sharing a water safety tip with me. - "Like" SwimWays and tell them I sent you! Please leave me your first name and last name initial to validate. - Worth 20 entries! Sign up and verify your free account at Zumbox through my referral link (https://www.zumbox.com/giveaway/23922wf). Once you sign up they will snail mail you a verification code within a few days that you must enter into the website to verify. Once you do that, you will then be given your own referral link. Come back here and leave me your referral link in 20 comments to get all of your entries. This giveaway is open to legal US residents 18+ only and will end on Tuesday, July 26 at 11:59pm EST. One winner will be chosen at random using Random.org and will be posted on the Winner's Announcement Page. Winner has 48 hours to claim his/her prize otherwise a new winner will be picked. Please leave your e-mail address in all of your comment(s) so I can contact you. I will not share your e-mail address with anyone, it will strictly be used to notify you if you win. Good luck! As a Swim Team Ambassador, I received free products for my family to use this summer. The opinions and views expressed in this post are my own. SwimWays is providing the product for this giveaway. One water safety tip is to fence in a backyard pool for safety of little ones. My water safety tip is to always keep an eye on kids when they are young, you really never know what they are going to do. And once they get older, never let them swim alone. If your child can't swim, definitely use floaties and make sure they are always within arms reach. my tip is for the older kids and adults always use the buddie system. never swim alone. no matter how many adults are around a pool with little ones always designate one to be on watch...that way everyone does not think everyone else is watching. Dont eat and then swim! Children should NEVER be left unattended in water, even for a second. My water safety tip is to always have an eye on your kids in the water. Never leave them unattended. Make sure if you have a pool you have at least a 5 foot wall or fence around it. Use the buddy system when swimming! A young man just died at a local lake after diving head first into 33" of water. Never dive into water that might be shallow. I had a brother that drowned when he was 17, alcohol related. Please don't drink and swim. Always have an adult within arms reach of a little one while in the pool. Tip: Don't run by the pool! It's inevitable someone is going to fall and risk serious injury when people are running on wet surfaces. Don't take your eyes off your kids. The first water safety tip that comes to mind is to NEVER swim alone no matter how old or young you are!